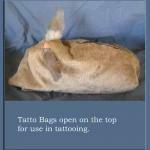 Bunny-Be-Calm Tattoo Bags Measures 10" long and 6" top to bottom. 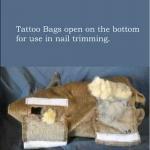 Made of sturdy machine washable fabric to safely hold a rabbit in place during tattooing or nail trimming. Holes at the top of the bag allow the ear to be released for tatooing. Velcro openings at the bottom allow feet to be released from the bag to trip nails.